Our neighborhood is rooted and grounded in love. Kindness seems to grow naturally like wild flowers and ferns. Friendships develop with time and nurture and sometimes out of nowhere you connect with one another quite unexpectedly. Not everyone lives in a community where the people whom you live around want to be friends and sometimes close like family. We are all different here; varying stages, ages, cultures and beliefs. There is a freedom to express who you are; having your own ideas and experiences to share. There is a root of acceptance and peace. With all that said, we are a beautiful composition of families & individuals; we embrace living together. We live in a woodsy neighborhood where we have a shared claim and responsibility. The land is shared between the people and animals. We are all a part of the scenery and we work on living together in harmony. There is "A Lot" of trees; the sounds and sights that come from the woods keep you wondering - what will emerge next? A big boy with a fishing pole, a blackberry picker, a wandering dog or a little one that is littered with dirt and carrying an array of sticks (don't worry parents are close by). Sometimes, you see a bear tipping a garbage can, a bobcat, coyotes hunting rabbits, a group of deer or feeding owls. Kids ride bikes and squeal - hellos are exchanged as neighbors garden or stroll along the wooded street. We greet one another with a hug and then we chat the about the weather, nature and current events. This is the neighborhood where we take care of each other; cooking for one another, catching a ride, gardening together, swapping kids, sharing duties, breaking bread, best of all camp fires and conversation after dark. There are quiet days and loud days, but no matter what kind of day or time - our homes are open, ready to help and love. Here is a peek into our second annual neighborhood celebration. A buffet of food and gathering of people. We all bring summer time offerings; it resembles who we are in the season or the kind of day we were having. New ingredients and recipes are introduced - we share, we try and laugh - Keeping it light! Our neighborhood naturalist, Jeanie Brown, makes the yummiest brownies. They are requested at every event. We like to mix things up - fresh and grilled vegetables on the same tray with hummus. Thanks Kara! We love to eat, this plate features two types of unique potato salads. 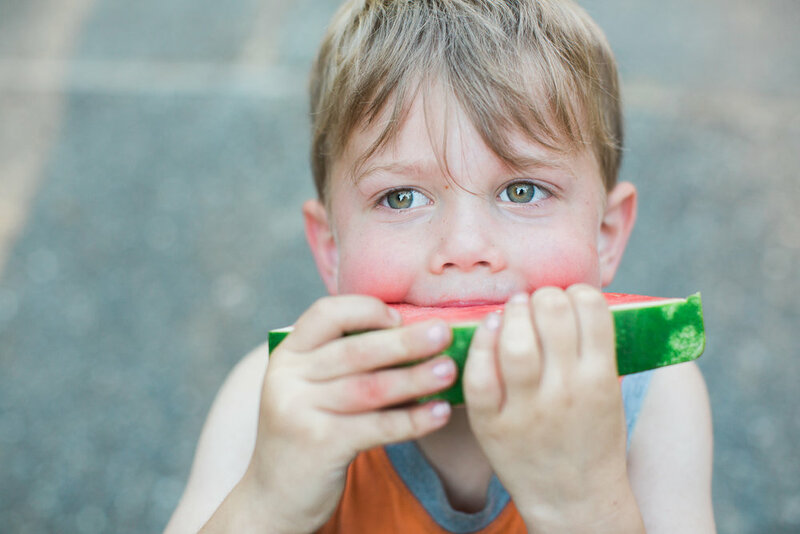 We keep the little ones cool with watermelon and Otter Pops. Aly makes a sweet and salty broccoli salad enhanced with cranberries, sunflower seeds and yes -BACON! A burger topped with lots of sweet onion jam! Did someone say brownies? It looks like Erik snuck a few before they hit the table. Ewa (Pronounced A-Vah) brought her camera and helped capture the moments of the evening. Cheers to being blessed by Salish Spring and lovely friends that make up our neighborhood. This week we are focused on root vegetables. We call them root vegetables because they grow underground, they absorb a great amount of nutrients from the soil. These vegetables get the needed support from the healthy rich soil, it is the foundation that supports growth and development of taste. Just like these vegetables, humans need deep connection too, it gives them strength and helps people to build character as they develop and change. In both of these cases you must trust in the process because the results are not immediately seen. When you sow seeds, nurturing and labor come first and then you watch things grow with time and patience. In the end, there is a harvest - reaping the rewards and results. Walla Walla Sweets are my favorite onion and they happen to be our state vegetable. This root vegetable grows to be the size of a softball and has a pleasant dulcet character that doesn't disappoint. These flavorful onions make their main appearance in markets and farm stands from June to August. Raw or cooked they will give your food a touch of sweetness and a distinct flavor that can't be compared to anything else. Keep it simple - these onions just need a few ingredients to be fully elevated. I like to use a combination of olive oil and Kerry Gold butter because it creates a smooth flavor, you get the best of both worlds. Additionally, Kerry Gold is developed through a natural process and has a pure rich taste. This butter is made from milk from grass fed cows, it is easier to digest for an almost non-dairy person like me. Keep your onions on medium high heat and add three teaspoons of sugar, you can't rush the process. With a little sugar and time you will achieve this beautiful caramel color. Just 5 drops of the secret weapon and Bam! These onions are perfect. Get a large sauté pan and put it on the stove top on medium high heat. Add half of the oil and butter. Add the slices onions then add the rest of the oil and butter, along with 3 teaspoons of sugar and a clove of chopped garlic. Add 1 teaspoon of French sea salt, then sprinkle onions with both finely ground pepper and seasoned pepper. Mix well, so all ingredients cover onions. Let cook for eight minutes initially, make sure your temp is spot on, you may have to adjust your temp according to your stove top. Start by stirring about every eight minutes - 2x through, then I go to every five minutes 3x through and lastly every two minutes a couple time through (sooner if needed). In the end they will be cooked down with a soft texture and Carmel in color. Add five drops of Worcestershire sauce, mix throughout. Take onions off the stove and let cool. Once fully cooled, place onions in a short wide mouth mason jar. You can store in your refrigerator for 3 to 4 days. You will see the onions transitioning from that uncooked and crunchy, clear and soft, to partially caramelize and then fully deeply caramelized. Jen and I created an appetizer plate with root vegetable chips topped with sweet onion jam and goat cheese, the final touches were cracked pepper and parsley from the garden. Hi, It's Jen here. I wanted to share with you a special recipe that my friend Sarah Mould gave to me when I got married 8 years ago. This potato salad has become a family favorite, additionally it is a hit at potlucks or BBQ's I go to. My friend Sarah has profoundly impacted my life. Sarah and her whole extended family are amazingly creative, not to mention loving and kind. They have the gift of hospitality and their love makes every meal a special experience. I have treasured every recipe that I have gleaned from Sarah and her family. German potato salad is yummy and has a vinegar based dressing - instead of the Mayo base like American potato salad, German salads use a quality vinegar to make it stand out. It's all about the dressing with potato salad and this recipe has an unforgettable dressing with the perfect acidity. I start with Yukon gold potatoes. The Yukon Gold potato was named for the Gold Rush in the Yukon because of its golden skin and flesh. I like using the Yukon Gold because they hold up well when boiled and you can leave the skin on as it's not tough, but easy to eat. Not to mention they taste like butter! Who wouldn't love that? Assemble the other ingredients:, fresh parsley, salt and pepper. The dressing is made up of red wine vinegar, rice vinegar, Dijon mustard and stone ground mustard along with olive oil. The red wine vinegar and the twotypes of mustard are what gives this salad its unique taste. I like to buy high quality mustard and vinegar along with good olive oil, as I want my dressing to taste amazing. Dice the potatoes into bite sized pieces. Cover with water and boil until just tender. Drain off the water and let it cool. Combine all the ingredients, except the potatoes, into a bowl. When the potatoes have cooled, stir everything together. Some traditional recipes serve the German potato salad warm, but when I'm going to a BBQ or a picnic, I usually take it cold. Wash potatoes and dice into bite sized pieces. Put into large saucepan and cover with water. Heat on stove until boiling and let simmer until the potatoes are tender and can be pierced with a fork. Drain the water from the pot and let cool. Combine shallots, Dijon mustard, stone ground mustard, rice vinegar, red wine vinegar, olive oil, parsley and salt and pepper in a bowl. Whisk until mixed well. Add to cooled potatoes and salt and pepper it again to your taste. Serve immediately or chill in refrigerator to serve later. PS: No words needed here!